*This is a Made-to-Order item. Please contact us at 401-4-LIGHTS for colors. 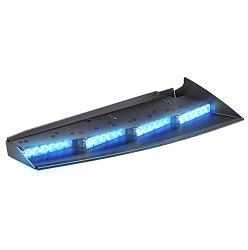 The Whelen WeCan Capable Outer-Edge Rear Spoiler Mount Lightbar features six Ion Super LED lightheads mounted on two Black Powder Coated Aluminum housings which mount easily to the rear spoiler. Each Ion offers 25 Scan-Lock flash patterns and is available in Amber, Blue, Red, and White. Each Ion wires have a connector that mates with the connectors on one end of a 20 foot, 3 wire, 16GA cable. The Outer-Edge Series is SAE Clas 1 certified and also meets SAE J845, SAE J595, KKK1822F, and California Title XIII specifications. 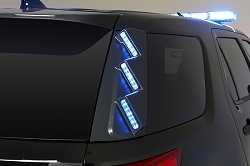 Whelen's durable Outer Edge rear lights are engineered for long life reliability. Fits 2015-2019 Chevy Tahoe and 2013-2019 Ford Police Interceptor Utility. This Model is WeCan Capable and requires a remove flasher, Cencom Carbide, Cantrol, or Remote 16 Module Purchased Separately to operate. Solo Model comes with all single color modules. Duo features secondary Amber Color for use as a traffic advisor. Two separate housings support three Ions lightheads each. Each Ion is available in Amber, Blue, Red, and White. Sychronizable to each other and other Whelen products. Both Black Powder Coated Aluminum housing mounts easily to the rear spoiler with the included hardware. Each lighthead has a pigtail with a weather resistant mini connector for easy configuration. Hard-coated lenses minimize environmental damage from sand, sun, salt, and road chemicals. Lightheads are fully encapsulated for moisture, vibration, and corrosion resistance. Two 20 foot, 3-wire, 16GA control cables. SAE Class 1 Certified with either Clear Lenses or Smoked Lenses. Meets SAE J845, SAE J595, KKK1822F, and California Title XIII specifications.